For this cut-report the Theatrical Version (R-Rated), provided by the US-DVD from Lions Gate, has been compared to the Unrated Version, represented by the US-DVD from Lions Gate and Maple Pictures. The MPAA has never gone easy on the "Saw" series. 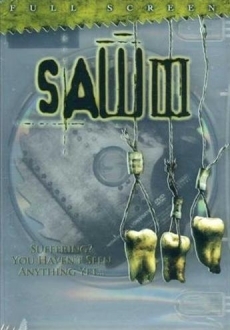 Director Bousman, who directed both the sequels "Saw 2" and "Saw 3", seemed to be taking a liking in turning both movies inside out for the Unrated DVD releases - apart from the violence cuts demanded by the MPAA several storyline sequences have been extended, changed and recut. Although a few scenes are somewhat better in the Theatrical Version (the absence of some shots in the Unrated Version, e.g. during Lynn's death is rather annoying), the Unrated Version is the overall better version. Surprising however is the dimension of the cuts. There are only a few extensions of violence that really make sense; scenes that are rather explicit for mainstream measures, like Jigsaw's brain surgery scene, have not been censored at all in the Theatrical Version. However, most changes would most certainly not catch the viewers attention without a direct comparison, due to the fact that they are mostly very short changes which only in a few cases enhance the scenes' brutality compared to the Theatrical Version . The Theatrical Version in Fullscreen as well as the Unrated Version in Widescreen have been released on DVD in America. Creditable is the fact that the Unrated Version and the R-Rated Version had been released at the same time, unlike the Unrated Version of "Saw 2" which had been released several months after the Theatrical Version. Also remarkable is the fact that the Fullscreen release is not presented in simple Pan & Scan but in a clever mix of pan & Scan and Open Matte, thus allowing for the relevant details to always be on screen. We want to warn everyone attempting to watch (imported) DVDs via their computer that Lions Gate has put all sorts of copy protection onto the DVD, so your computer may not be able to read it correctly. Time data provided for both the R-Rated and the Unrated only concerns the recut scenes missing in one of the two versions (if not stated otherwise). Changes with a length of only one single frame are not listed, violence cuts excluded. Because of the differing aspect ratio of the two versions it is difficult to identify alternative shots. Only those shots differing in content are listed in the cut-report. A "+" sign in front of the time data indicates that the scene is longer in the R-Rated. Due to the large amount of alternative footage and recuts it is impossible to calculate an exact running time for the cuts made. Running time of the Unrated Version without credits: 1:49.11 min. Running time of the R-Rated Version without credits: 1:43.39 min. The time data comes from the DVD of the Unrated Version. The blackscreen is a little longer in the Unrated. Xavier's corpse from "SAW II" on the floor of the room from „SAW“ is longer illuminated by Eric. Eric hits his foot one more time in the R-Rated (off screen). Right after the close-up of Eric hitting his foot, the removed part has been re-integrated into the Unrated, followed by a second close-up missing in the R-Rated. Eric smashes his foot one more time. After Eric has broken his own foot, the end of the shot in which the light-cone is not anymore illuminating the foot is a little longer. The blackscreen after the „SAW III“ title is longer in the R-Rated. Troy standing longer in the middle of the abandoned classroom. One (!) frame is missing during the camera movement towards the ring in Troys shoulder. The end of the shot of the ring in Troys shoulder is a little bit longer as well. The ring in Troys waist can be seen a little bit longer as well. Same here with the ring on Troys arm. Same here with the rings on Troys feet. Only two frames have been removed during the shot of the ring through Troys right shoulder. Two frames are missing during the shot of the ring through Troys right hand. Two frames are missing during the shot of the ring through the right side of Troys waist. Two frames are missing during the shot of the ring through Troys right leg. Two frames are missing during the shot of the ring through Troys left hand. The end of the shot of the hand is not brightened up in the R-Rated. The ring through Troys jaw is presented a little longer. Troy is breathing out after a few frames of the jaw-shot is missing. The long shot of Troy standing in the classroom is also shortened at the beginning. Troy does a practice-rip with his hand. Longer shot of Troys face. A longer shot of Troys face after he has ripped the ring out of his right shoulder. Troys back as well as the wounds caused by the ripping can be seen. While Troy rips the ring out of the left side of his waist alternative footage has been used in both versions. A policeman taking a picture. The policeman tells Kerry that Eric is not a homicide case but only a missing person. Kerry tells him about her nightmares and the policeman assures her that Eric's disappearing is not her fault. Another shot of Kerry walking towards the mirror. Thanks to the cut at 9.58 the viewer of the R-Rated knows nothing about Kerry's nightmares, so the following scene in which she sees Eric in the mirror seems somewhat illogical. The shot of the room in which the "Angel Trap" is placed is a little longer in the R-Rated before Amanda appears. Front long shot: The trap rips open Kerry's ribcage of which only a few frames can be seen. Back long shot: The "wings" of the trap are spreading, the two halves of Kerry's ribcage hanging from them. Front shot of Kerry - her arms go limp. Back long shot: Kerry goes limp. Several shots of chains hanging from the ceiling. 2 Frames of Kerry with open ribcage. 2 Frames of the acid jar. Not in the time data: Whitescreen followed by a longer camera movement away from Kerry's corpse blending into a shot of Lynn and her lover in bed. Front long shot: The trap rips open her ribcage which is shown very long and in two different frontal long shots. Back long shot: The two halves of Kerry's ribcage are hanging from the "wings", her arms go limp. Kerry's intestines are falling out of her stomach. Close-up of Kerry's open stomach, the picture becomes increasingly blurry. Jeff hammering against the crate after the first long camera movement. After another shot of the outside of the crate Jeff hammers a little longer. The next shot of the hammering has been shortened as well. The wall of the crate gets kicked one more time before it breaks. Some more of Jeff's raging before the crate falls off the forklift truck. The shot that is used here in the R-Rated is in the Unrated as well, somewhere in the middle of the cut – an exact indexing is next to impossible due to the differing aspect ratios, so I subtracted the running time of the sequence in the R-Rated from the total running time of this sequence in the Unrated. In the list of cuts this one is regarded as two cuts. During the first flashback two short shots of Jeff's daughter have been added. 3 frames of Jeff's daughter are missing in the fast sequence after Amanda appears behind the door. The next few fast shots of the daughter have been replaced by 2 frames of a cuddly toy. Already a few frames later there are again pictures of Jeff's daughter missing. Jeff walks through the hanging plastic stripes. The sequence of the writhing Jigsaw with the closed-circuit breathing apparatus is longer in the R-Rated. Jeff walks through the corridor for a lot longer. After he has discovered something on a wall (not really identifiable because of the darkness) he wipes his hands on his clothes. Again Jeff walks a lot longer in the Unrated, lifting a plastic tarp with the piece of wood in his hand. The shot where he discovers the "Face your fears" writing is longer in the R-Rated. The shot of him walking past Danica is a bit shorter. Danica starts to speak. The beginning of the shot is a bit longer in the R-Rated. Jeff looks up to the lock and reaches into his pocket. The shot of him walking past Danica is a bit longer. Danica starts to speak. The beginning of the shot is a bit shorter in the Unrated. Now Jeff looks up to the lock and reaches into his pocket. After the second flashback about the death of Jeff's son (the last shot shows Danica in her car) follows a very big change of footage. Jigsaws tape is playing in both versions but the pictures are completely different. While the scene is still "calm" in the Unrated, the trap activates itself a few seconds after the flashback in the R-Rated. So Danica is already sprayed with water when the tape is playing. The length of the pauses between Jigsaws sentences on the tape are different in both versions; one passage is missing in the R-Rated. Long shot of Danica getting sprayed with water. Longer close-up of Danica's face in the R-Rated. The end of Danica's next long shot is longer in the R-Rated. The following shot of Jeff is different. Before Jeff gets the key the R-Rated contains a sequence missing in the Unrated . Jeff tries to open the door with the key from his pocket, then hammers against the door with his foot - fast pictures of Danica in between. Jeff stands in front of the bars a little longer before reaching for the key. Jeff reaches for the key. Longer shot of Jeffs face reaching for the key. 2 fast shots of Danica. The sequence of Jeff trying to open the door with the key (46.33 in the R-Rated) has been re-integrated into the Unrated, including fast shots of Danica and Jeff trying to reach the other key. Two additional shots of Jeff reaching for the key. A shot of an axe is seen in the R-Rated, while Lynn is talking to Amanda. The Unrated contains a little logical flaw in this scene.Amanda says "Like this axe I saw you (were) looking at" although Lynn has not been looking at any axe in the Unrated. Amanda leaves building in Slow Motion (R-Rated). Jeffs face is on screen a little longer as he walks through the hallway. Longer shot of Jeff standing in the hallway. Jeff makes a few steps looking around. The end of this shot is longer in the R-Rated. The shot of the first pig is a bit longer in the R-Rated. So is the shot of Jeff. Jeff peers disgusted into the container in which Judge Halden lies. Then another wave of mushed pig hits the judge. Longer shot of Judge Halden lying in the pig-juice before he begins to talk. Another shot o the disgusted Jeff. A longer shot of the judge before the next pig appears on screen. A bird´s eye view on the judge has been added. A medium long shot of the judge in the pig-mush and two shots of Jeff have been added. The end of the shot of Jeff wiping his mouth is missing in the R-Rated. Jeffs shot begins a little earlier. Jeff walks down the stairs. The shots of Jeff, before the pigs are being railed into the room, differ in both versions. The Unrated shows many shots while the R-Rated only shows one. The pig shot is a bit longer in the R-Rated. The Unrated contains an additional shot of Jeff followed by much more gruesome pictures of the pigs. When Jeff walks towards the glass case containing his son's cuddly toys the R-Rated runs in slow motion while the Untated runs in normal speed. In return, the following shot of Jeff is longer in the Unrated. Longer shot of Jeff walking away from the glass case. The shot of Jeff is a bit longer in the Unrated while the R-Rated contains a long shot of the cuddly toys catching fire. One shot of a burning cuddly toy is longer in the R-Rated. The Unrated contains several new shots of the events. The removal of Jigsaws scalp is a bit longer in the R-Rated. The shot in which Lynn begins to say "Fill that syringe with Alcohol" differs in both versions. The blackscreen after the shot of Amanda looking around is longer in the R-Rated. Lynn wipes her face after she saw Jigsaw lying in his bed. Both versions contain different shots of Amanda throwing herself at Jigsaw. A longer shot of Tim screaming. In return, the next shot of Jeff is longer in the R-Rated. Both versions contain different shots while Jigsaws tape is playing, each with shots of all participants. The breaking of Tims right arm is missing completely in the R-Rated. The shot of the judge pulling the cord in the shotgun case was also used for the Unrated at this point. A shot of Jeff has been integrated. Both versions use different shot for the twisting of Tims right arm. Both versions contain different shots of Tim as the judge tells Jeff that he is an accomplice of Jigsaw, should he not help Tim. Different shots of the judge have been used here. Different shots of Jeff and Tim have been used before Tims broken left arm is seen. After the shot of Tims broken left arm another shot of Jeff and the judge is only shown in the R-Rated. The breaking of Tims right leg is missing completely. Jeff takes a look at the shotgun case. The shots of the judge are different. Jeff looks into the shotgun case and reaches for the key. The shot from time data 1:26.15 has been re-integrated into the R-Rated: Jeff examines the mechanism of the shotgun. When Jeff gets the key both versions have been cut extremely different so that a detailed comparison is not possible or reasonable. The recut starts with Tims splintered leg and ends as the shotgun goes off. A shot of the wounded judge an another shot of Jeff are missing in the R-Rated. Integrated into the R-Rated: Tims right leg is breaking while Jeff walks towards him. Due to the fact that Jeff already did walk towards Tim in the R-Rated but not in the Unrated, different shots of Jeff are shown after the "Rack Trap" has begun to twist Tims head. Another set of differing shots. The end of the "Rack Trap" scene is different in both versions. The end of Jigsaws shot is a little longer. Jigsaws questions concerning the other test subjects is different. The second flashback has been recut as well. The shots of Erics destroyed foot and Eric leaning against the wall are now connected by a camera movement. Another rather large recut flashback about Eric. Because of the many changes a detailed listing is not possible. Eric beats Amanda one more time. Eric smashes Amandas head against the wall. Again Amandas head is smashed into the wall. Eric and Amanda are on screen at the end of the shot. Nothing spectacular happens, though. In the Unrated a slightly closer shot has been intefrated into the shot of Amanda kicking against Erics foot, not really resulting in a more gruesome effect but a little jump cut – but one hardly notices due to the overall speed of the scene. In return, the "normal" shot is a little longer in the R-Rated. Amanda moves her leg away from Erics foot. Another shot of Jigsaw bleeding. The shots of Jigsaw bleeding differ in both versions. We see Jigsaw a little longer before he turns on the tape recorder. After Jigsaw has turned on the tape recorder the shots are different again. The following shots of Jeff and Jigsaw are different as well - the R-Rated contains a longer shot of Jeff, the Unrated one of Jigsaw. The R-Rated has a longer shot of Jeff in it, the shots of Jigsaw are again different and also longer and gorier. The shot of Jeffs daughte is different in both versions. The "clipping" is bigger in the Unrated moves differently over her body. Jeffs screaming is slightly different in both versions. The camera movement around him and Jigsaw is longer in the R-Rated, the close-up of his face appears earlier in the Unrated. Another shot of Lynns necklace is added in the R-Rated before it explodes. The ending is different as well.